Walking out of Central Station Milan from under the domineering gallery of this overwhelming building, a large spacious plaza opens to the boulevard heading into the center of town. 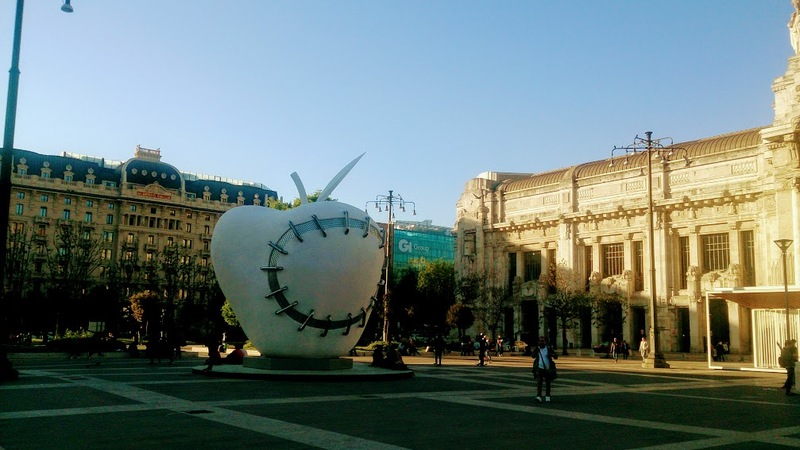 In the plaza in front of Central Station Milan, there is a giant, white Apple with a bite that has been repaired with steel stitching. A sculpture by Michelangelo Pistoletto which had been donated to the city of Milan in honor of the food and nourishment themed Expo of 2015. The sculpture is 8 x 8 meters high and weighs 11 tons. It is made of a steel structure covered in powdered marble and clay plaster. The stitching is made of stainless steel bars. According to Corriere, a variant of the apple was in Piazza Duomo and covered in grass during the expo and subsequently vandalized; the headline stated the apple was “Peeled by vandals”. The Italian title of the sculpture is “La Mela Rintergrato” – “The Apple Made Whole Again” * and according to an interview with the artist in Panorama, the sculpture represents nature and the use of modern technology to save and replenish what has been lost. The apple has always been a symbol of life and the bite is what we have lost and must repair. * Many translations use “the reintegrated apple”, but the Fondazione Pistoletto uses the more appropriate title “The Apple Made Whole Again”. Hotel Charly – a 5 minute walk from the station, some rooms have balconies over looking the garden.